Emoji number plates: which would you choose? Have you ever been in your parents' car and thought 'wow, if only the number plate on this car could express my personality a bit more'? Well, probably not, but that's exactly what's going to possible for drivers in Australia. Introducing the emoji number plate! 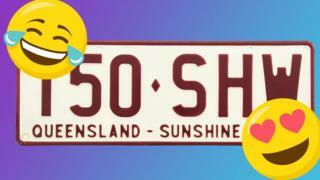 From March people with personalised number plates in Queensland, Australia will be able to choose from a range of emojis to go alongside all the numbers and boring bits that we're used to. The faces won't actually make any difference for tracking and registration information, which is what a number plate is for. But they'll at least jazz up a traffic jam! Only a few emojis are available, so if you were hoping to catch a poo or dinosaur emoji on the road, you won't be in luck. If emoji number plates existed in the UK, which emoji would you choose? Want to know what certain emojis mean? The Big Question: What was the first emoji to be invented? If this came here that would be awesome! 'Cry laughing' Emoji all the way! I wouldn't want an emoji on my car.